Due to increasing demand of water in the world, it is becoming more and more important to protect the pipeline network against any damage such as majeure leakage to a network downstream of main water reservoirs. In the case of "force major" or human generated damage to the pipe network, the water authority may suffer major loss of water volume from the reservoir before being able to fix the leakage. Raphael Valves recently supplied such protection valves at the “DALIAN SHANGHAI WATER TRANSMISSION PROJECT” (total project cost of 135M$) to DALIAN WATER SUPPLY GROUP in the Shenyang province, China. At the project, 8 water reservoirs supplying over 50,000 M^3/Day, were protected using over 50 units of G-90 Enamel coated, burst control valves sizes DN 100 to DN300. G-90 is a self-operating safety valve. G-90 is equipped with a pre-calibrated orifice plate at the valve downstream with two sensing ports. In the event of over demand due to burst, the pressure delta across the orifice is increasing and sensed by a pilot valve that forces the G-90 valve to close automatically. The operator will manually re-set the valve open, only after the damage was fixed. High mineral (Calcium and Magnesium) dissolved concentration in the water - Enamel coating was applied at 750 C. to the valve internals to prevent sedimentation. No electricity at the installation location – G-90 is a stand-alone solution without the need of electricity to operate. Very shallow water level at the reservoirs to operate an anti-burst valve – G-90 with 3 way control trim will operate at a pressure as low as 0.2 bar. 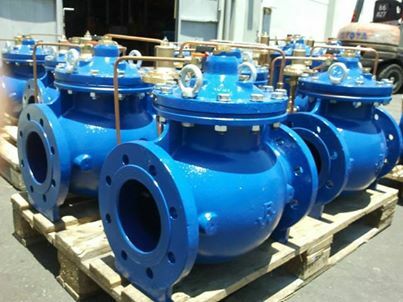 For more detail please contact Jonatan Ben-Tal at Raphael Valves Industries.